It wasn’t one of my most brilliant ideas. My dogs have a nice, warm place to sleep outside, why shouldn’t the cat have the same creature comfort? I found a local craftsman who was willing to make a “cat house,” complete with blue siding, white trim and genuine shingles. Proudly, I placed it on the front porch for Mex, my son’s pure white, cross-eyed cat. He hated it. Unfortunately, though, the neighborhood cats thought the house was the coolest thing since catnip. One afternoon, Kira, our devoted and always hungry dog, stationed herself two feet in front of the cat house and let out a howl that would curl your toenails. Despite our best efforts to remove her from the front porch, she stood her ground and emphatically insisted that whatever was inside was probably edible. The objects of Kira’s attention turned out to be two newborn kittens. A big, wild-eyed, feral cat had apparently disagreed with Mex’s opinion of the cat house and had chosen it as the best place to birth her babies. My husband brought in the tiny animals and we were all instantly enthralled. She had left us one large kitten that sported perfectly placed tiger-striped enhancements to its beautiful white coat as well as another, non-descript, smaller one. As Kenny tried to place them in my hand (both would fit in one palm), I took the gorgeous white one and left my husband holding the other one. The kitten I held was adorable, but I knew he needed his mother. Hoping she would return, I placed both kittens back in the cat house and waited. She did return, but only for one of them. 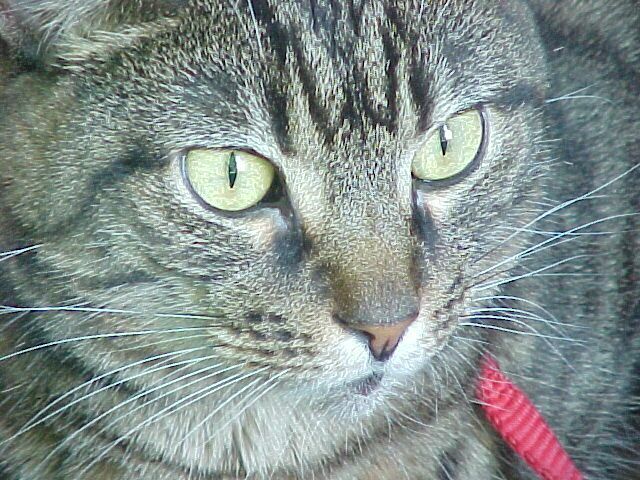 I was heartbroken when I realized that she had taken the bigger, prettier kitten and left us with the tiger-striped runt. Twenty-four hours went by and sadly, I knew that, like it or not, the ugly one was now my responsibility. As I looked at the one day old, puny animal, I lamented the loss of the perfect one. “We can just try to raise it until it’s about 6 weeks old, then we can put an ad in the newspaper to get rid of it,” my husband offered. A non-committal shrug was my reply. Seeing little choice, I scoured the internet to find out how to raise him. The answer was the same everywhere I looked. Being a substitute mother to a one-day-old, abandoned kitten would be nearly impossible and the odds of him living were very, very small. The veterinarian next door to us concurred. It didn’t really matter, he was, afterall, just the ugly one. For the next 6 weeks, Poco (Spanish for “little”) had to be fed every four hours with a tiny bottle. Since I was the only one in the family he would allow to feed him, the job was exclusively mine. Everything his mother would have done for him, I had to do, including washing his coat several times a day with a rough washcloth. Too little to take care of himself, Poco went on our mini-vacations, slept in a playpen beside my bed and became a seemingly permanent fixture on my shoulder. Then, without me even realizing it, something happened. No longer did Poco seem like a burden. No longer did I think of him as second best to his “prettier” brother. We passed the six weeks mark and I simply neglected to remember my husband’s newspaper suggestion. Happily, Poco was mine. He thought of me as his mother and his utter devotion to me remains to this very day. The point of the story is that prejudice is rampant in our world, even to those who claim not to be capable of it. I have a degree in anthropology, the study of humankind. In my heart, I know that my purpose on this Earth is to help promote understanding and acceptance between all the people who are somehow “different” from one another. I hate prejudice. I hate the practice of judging a person, or a group of people, by physical characteristics or by geographical origin. Thanks to my training, I learned to become "prejudice free." ….Or so I thought. I had judged Poco by the color of his coat and by his size. I assumed that he was somehow “less than” in comparison to his more perfectly marked brother. I didn’t want to hold him, I didn’t want to keep him, I didn’t want to give him a chance. I had committed the very same social crime that I live to eradicate. I was capable of prejudice. 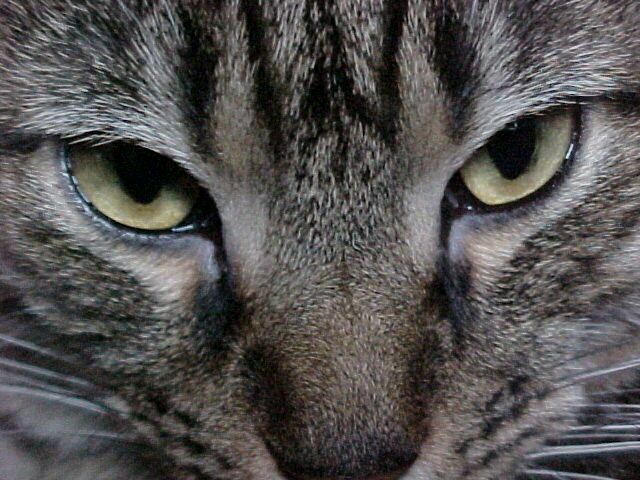 Yes, my prejudice was only directed at a cat. It isn’t the same as judging human beings in a similar fashion. Or is it? Regardless of species, I was still CAPABLE of it. Moreover, I was ready and willing to judge based on a physical characteristic. The color of his coat has nothing to do with the cat that now eats out of the sugar bowl every chance he gets. It has no bearing on the animal who has a penchant for glazed donuts and Cool-Whip. The lack of white on his body has nothing to do with the love he gives me unconditionally. I was so short-sighted that I allowed color to get in the way of Poco’s true nature. How many people have I judged similarly without even realizing it? The question demands an answer not only for myself, but for humankind as well. We are all capable and those who proclaim themselves totally free of prejudice may be the ones most at risk. We have to stop ignoring the prejudice that happens around us, to us and because of us. If we look for prejudice, we are sure to find it. The only way for us to get rid of something is to locate it in the first place. In this case, ignorance is not bliss. The southern slaves were freed and American women are in the workplace. So, prejudice and the negative consequences it entails are over in our country, right? Ask a skateboarder. Ask a punk rocker. Ask a “nerd.” Ask someone who is overweight. Ask anyone who is “different” than the American status quo. It’s very much alive and more dangerous than ever. It hides behind catch phrases like “politically correct” and “color blind” and in doing so, it is able to grow like a cancer. As a country and as individuals, we need to actively search for the social malady that is prejudice. Only then will we be able to expose its dangerous consequences. More importantly, only then will we be able to eradicate it from the hearts and minds of even those who are supposedly immune to it. I opened my eyes, admitted my stupidity and corrected my erroneous judgments. In return, I was rewarded with a honest, loving relationship. If the same process were applied to humans, prejudice wouldn’t stand a chance. 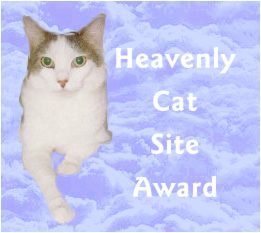 Many thanks to the great people over at I-Love-Cats.Com for this award. When you are done here, how about surfing over there to check out their site? Just click the award to visit. Thanks to Pyewacket for the two awards below. 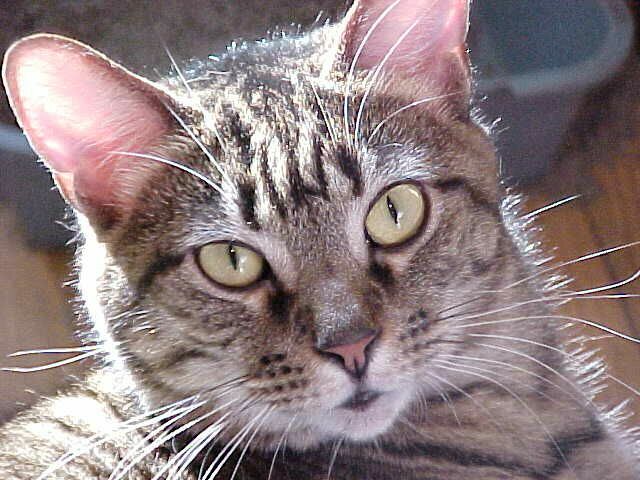 If you haven't been to Pyewacket's site, please click the award to visit. You won't be sorry! 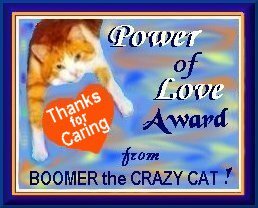 My sincerest thanks to Boomer for this special award. This is one terrific place to visit, so just click on the award to be beamed on over there. Thanks to catanna.com!! This site has it all -- cute tabbies, postcards, graphics and so much more. Don't forget to click on the awards below to visit.